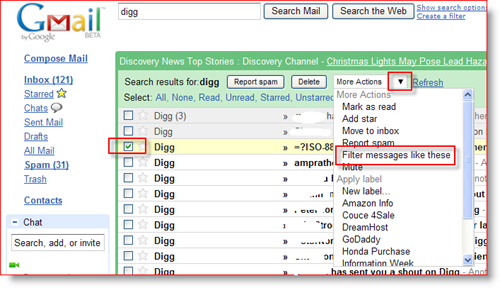 Recently, my DIGG Friends have been very active which has resulted in over 100 emails a day in my Gmail account. Although I want to keep track of my friends and I want the emails, it’s causing Havoc (Inbox Sprawl) in trying to keep my Inbox clean. 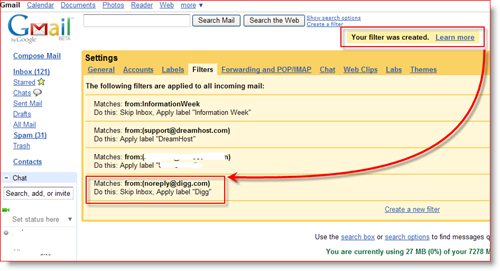 Good news is, Gmail has a solution for this kind of thing and today I’m going to show you how to take control of your Gmail Inbox using Gmail Filters. 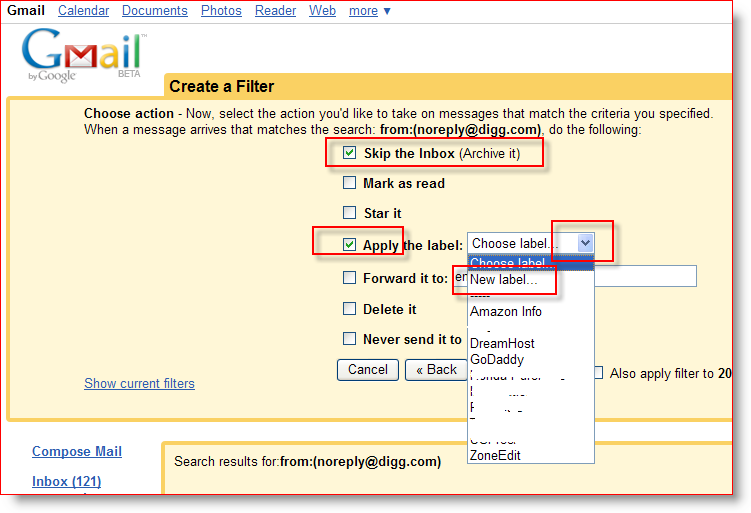 Gmail Filters is a feature enabled on all Gmail Accounts which allows you to set up Rules for inbound, outbound and current email in your Gmail Account. The options are very simple to use BUT, very robust! They allow you to do virtually anything with your email! Today I’m going to setup a “Filter” or “Rule” which takes all emails from DIGG, Applies a DIGG Label to them and then Archives them so that they never hit my Inbox. 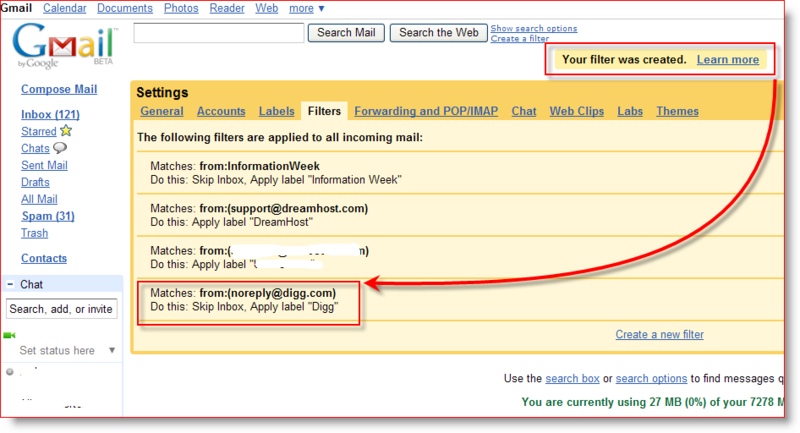 This setup should solve the problem I mentioned above (DIGG Shout Sprawl in my Inbox). 3. Check the Radio Box for Skip the Inbox and Apply the Label. Click Down Arrow for Choose Label and either select an existing Label or click New Label to create a new one. In my example, I created a new label called Digg. 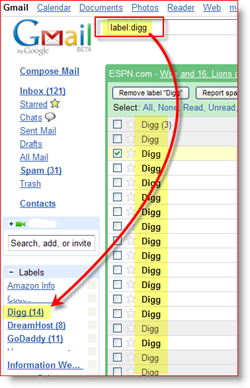 In this example, a Label of Digg is assigned Automatically to all current and future emails from DIGG. By spending only two minutes, I just made emails from Digg easy to find (very organized), AND I reduced all my Inbox Sprawl from Digg! Did I mention this is a huge time saver for me because I no longer need to delete/label all these emails manually? More Questions? Comments? Would love to hear from you! As always, please post Comments below and Questions in our Groovy Community Forum. I’ve been using this for a few months and I an confirm how useful this is. The example you gave with digg is great and I also use this for linked, YouTube and filtering trusted website advertisements. Thanks groovy man.